The Integrated Riot Investigation Team,created in the wake of last year’s Stanley Cup Riot, released its second “Most Wanted” poster Thursday. 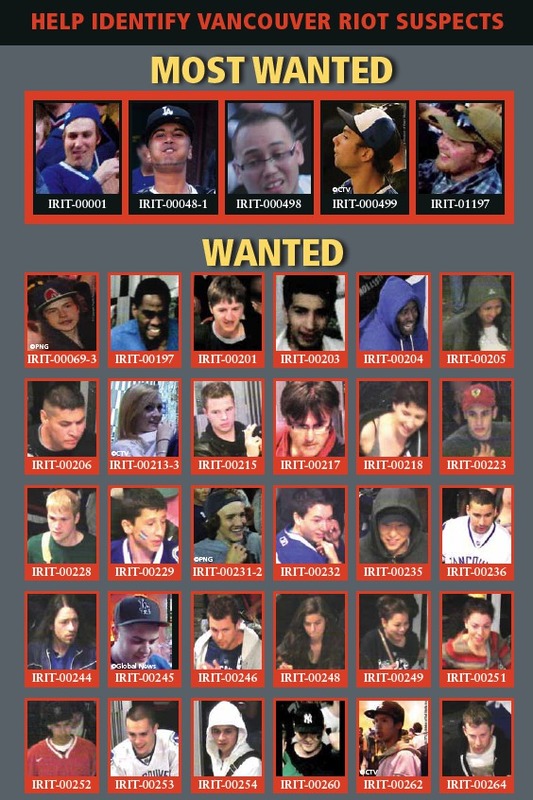 More than 340 volunteers and 70 police officers, including Surrey RCMP, took to major transit stops to distribute the poster in the hopes of identifying more suspects. Not bad for a day’s work. Police say they have already received 1,594 tips from the public on rioters’ identities. As of Mar. 9, IRIT has recommended charges against 150 suspects and Crown has approved charges for 67 alleged rioters. As has been widely reported, many of the charged suspects are Surrey residents. It obviously isn’t the greatest point of pride for the city, but RCMP and VPD officials have already agreed that during the 2012 playoffs run, alcohol checks will occur at transit entrance points on game days. That means when you get on the SkyTrain at Surrey Central, an RCMP or Transit police officer will be waiting to pat you down. Also on Thursday, Crown approved two charges against 19-year-old Surrey resident Mustafa Khan (participating in a riot and mischief). Last Monday, Surrey resident Willmar Ovando-Renderos, 24, was charged with participating in a riot, disguise with intent and break and enter. Emmanuel Alviar, 19, – pleaded guilty this week to participating in a riot. Alviar’s sentencing hearing is scheduled for May 3. Police say the number of charged suspects will continue to rise as more tips roll in.